If you are interested in finding a fellow Woodbury resident to play some tennis with, please click here for the pdf of email addresses. If you would like to be added to the list, please email Kayla at kstephenson@keystonepacific.com. Our office has had an increasing amount of residents approach us with concerns regarding the tennis court reservations and the tennis courts. There have been complaints regarding residents reserving a court and not showing up without canceling and/or people showing up very late to their scheduled time. We spoke with the Board of Directors at their August 2017 meeting, and we have decided to now make Court #3 an open play court. 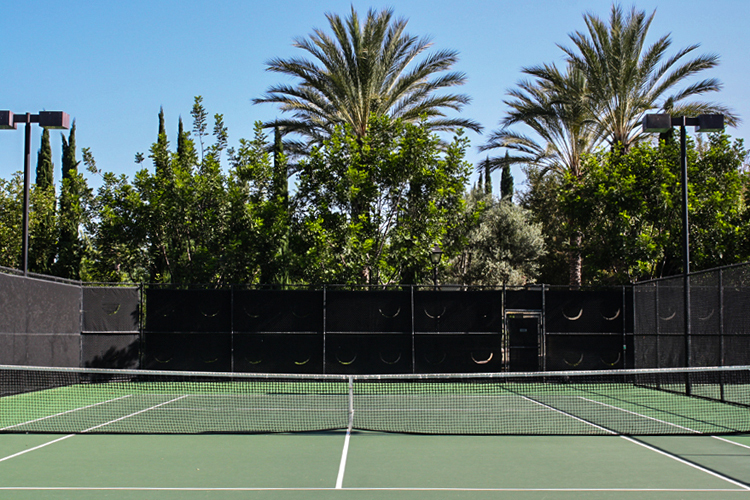 The only tennis courts you will be allowed to reserve now are Court #1 and Court #2. Play on all tennis courts when not reserved is limited to one and one-half hours (1 1/2). If at the end of the one and one-half (1 1/2) hours no one is waiting for the court, players may continue to play until another party arrives. Players are reminded to be respectful and courteous at all times to other community members and players. If a problem arises, please contact Management directly at (949) 451-1654 or (949) 451-1650. Elite Security may also be reached at (714) 801-4385. Reservations may be made online by clicking the "Book Now" link below. First time users will be required to sign up (it's free). For the sport court rules, please view the attached PDF. Upon completing a court reservation, please bring a printed (use of PDA or Smartphone is acceptable) confirmation to court. A daily schedule will be posted in front of tennis court 2 in the bulletin board showing reservations. Please click here for the sports court rules and regulations. To make a reservation on our new platform, please click on the "Book Now" link below. Please note, you must be a Woodbury resident in order to make reservations. If this is your first time reserving a court and you are a resident and need a login, please click here to register. For any questions, please contact Kayla at kstephenson@keystonepacific.com or (949) 451-1650.